The meter has officially started running on California’s efforts to meet strict new water conservation targets from Governor Jerry Brown. 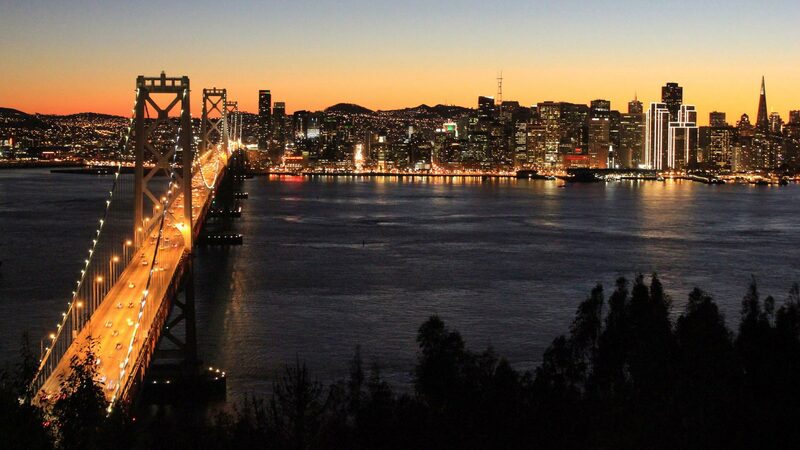 The first-ever statewide urban restrictions aim to cut water use by an average of 25 percent. The actual cuts vary from place to place depending on the water use in each local district. Some water-thrifty areas only have to cut 8 percent, while larger cuts go up to 36 percent. How local cities and water agencies achieve those cuts is up to them. Most are passing rules that limit outdoor watering, but some are targeting other industries, creating some clear winners and losers. 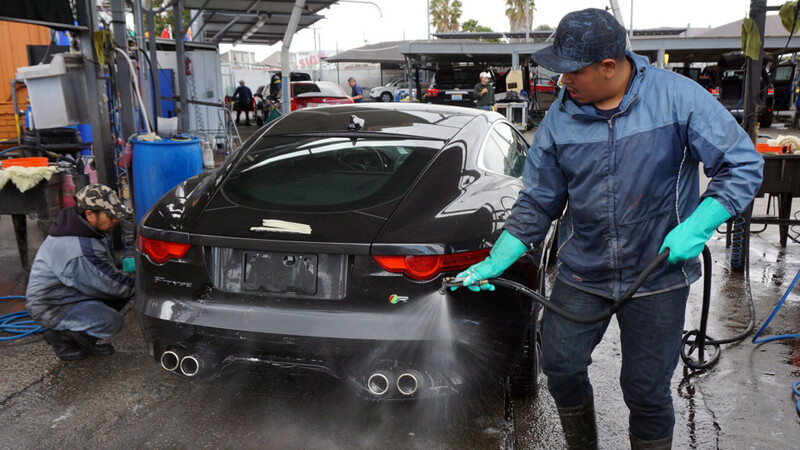 “I’m sure in summer we’ll see an influx in business, which is great,” said Jeff Wheeler of AJ Auto Detailing in San Jose, where his crew is pressure-washing a row of cars. Just a month ago, the San Jose City Council passed drought rules that most car washing businesses could only dream of: if you live in San Jose, you’re no longer allowed to wash your car at home with potable water. Washing cars at home is still allowed by most other water agencies, if residents have a shutoff nozzle on their hose. But San Jose has banned it with or without a nozzle because the city is aiming to cut water use by 30 percent. Wheeler's car wash has an added selling point for drought-minded customers: water recycling. The sudsy water flowing off the cars is recaptured, filtered and put into large tanks. Each gallon is reused four to five times. “We’re actually only using about 2-to-2.5 gallons per car and that’s less than a dishwasher uses,” Wheeler said. While most car washes recapture at least some water in California, Wheeler’s is part of the WaterSavers program, which accredits car washes that recycle higher levels of water and filter what they discharge. The recycling system cost $90,000 to purchase and install, but the business is seeing a return in lower water bills. “When we bought it three years ago, I don’t think anyone thought we’d be in a drought in 2015,” Wheeler said. But alongside industries getting flush from the drought, are others on the losing end–including one that’s a symbol of the California dream. “Pretty much every customer asks about the drought,” said Marc Hannigan as he walked through the showroom of Royal Pools in San Jose where several pools are on display. There’s reason to ask: at least 30 California water agencies and cities, including San Jose, Dublin and Morgan Hill, have passed drought rules about pools. Most have banned filling new pools with potable water. Others are considering bans now, which doesn’t surprise Hanngian. He says pools are an easy target. Hanngian is referring to a commonly cited analysis done by the Santa Margarita Water District, comparing the water use of backyard pools to landscaping. 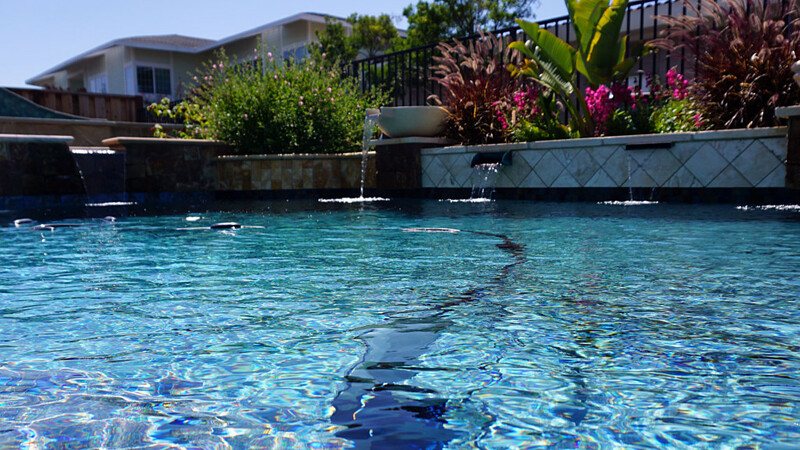 A new built-in pool can require 20-to-30,000 gallons to fill up. After that, it uses much less. According to the study, a pool, especially with a cover, can use less than a lawn does over time, but it takes three to five years to reach the break-even point. Filling new pools is a small slice of the overall water use in most water districts. In the city of Dublin, new pools account for just a tiny fraction of one percent of the use. But the Dublin San Ramon Services District prohibits filling new pools because they’re considered a non-essential use of water. "The tens of thousands of gallons that it takes to fill a pool may not matter much in aggregate,” said San Jose Mayor Sam Liccardo. “But to build new pools and create demand for something that is not critical in terms of need simply does not move us forward in our water conservation goals." “We’re all in this thing together and that means we all need to tighten our belts and in some ways, that’s not always comfortable,” he said. The pool industry says it's already feeling uncomfortable. As water agencies put together their own mix of water conservation rules, many are having to walk the line between water savings and behavioral psychology. But in water districts that have low conservation targets, some rules are less about saving water and more about getting the public’s attention, like the one that prevents restaurants from serving water unless customers ask for it. By making everyday Californians feel the pain, Cooley said, they’re more likely to step up and make lasting changes, like putting in drought-friendly landscaping. The more permanent changes, like taking out lawns and installing more efficient water appliances, will make conservation easier when the next drought rolls around. State regulators expect to release data about how well – or poorly – water agencies are saving water in mid-July.